We are involved in the manufacturing, supplying & exporting a wide range of Cotton Jumpsuits that are especially designed in floral prints. These Jumpsuits are fabricated using premium quality soft fabric, that enhances the personality of the wearer. 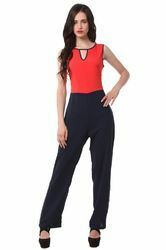 Front open jumsuit done in printed cotton fabric with mega sleeves, double collar, gathers details at the shoulder, side pockets, elasticated waist band and folded hem. 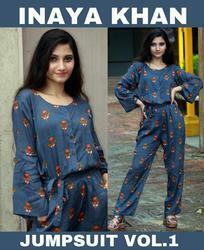 Our renowned clients can avail from us the most preferred range of CottonJump Suits. These shirts enhance the style statement of men of all ages. Made with the best quality fabrics, these are offered in prefect finish and designs. We supply these in distinctive colors, striking styles and prints, in line with the clients’ needs.